Highview is the perfect retreat for your group of up to 10 people. Perhaps the most perfect views of the entire ski area from a downtown home! This two-story home boasts a wonderful layout with 4 bedrooms, three full baths, dining area, full kitchen and living area with wood burning fireplace. Separate Family Room. 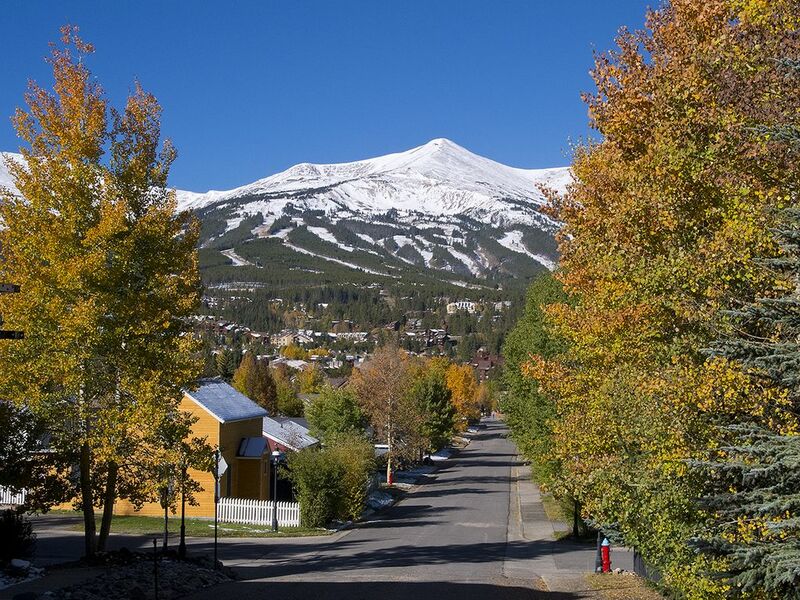 Highview is just 2 blocks from the shuttle...And an easy walk to all of the restaurants and shops in Breckenridge. 4 Blocks to Main Street shopping, restaurants and Nightlife! •	Hot Tub on deck for the Duplex. Jane Hamilton with Jane's Lodges Representing The Beathard's and Goodman's from Texas. The incredible view of the Ski Area; and the ease of walking everywhere in Breckenridge. Unbeatable Location..... Enjoy the gorgeous views from the big front deck and Living Room. The back has been landscaped to create a private Hot Tub area and grilling/dining deck! Gorgeous Ski Area and Mountain Views from the Living Area, Front Deck and Den. All beds will be freshly made prior to your arrival. 2 spaces in front of the duplex. 1 private space behind the duplex. Brand New Kitchen in November 2013! Satellite Service TVs, Fully appointed Kitchen, Linens and towels provided, Hot Tub on Deck, Propane Grill, Private deck with great views of the Ski Area, Located in Breckenridge's Residential District, Shuttle just 3 short blocks away, Great Location, Walk everywhere! We had a beautiful stay in March with a group of friends. There was plenty of room for everyone. The property was very well kept, and beautiful throughout. The Highview House is just a short walk from Main St and other restaurants and shopping. Our group included multiple small children. We hope to stay here again in the future. Just returned from an amazing ski trip. This house was perfect. It is a short walk down hill to two bus stops so that if you miss one, another is on its way. The bus even stops at the grocery store so you never need a car to get anywhere. Main street is an easy walk and full of great restaurants and shops. The house is so beautiful and fully equipped. We cooked in several nights because it was so comfy. There is a hot tub to relax after a long day of skiing. The views, day and night, are spectacular. Will definitely book this home again! Ideal location -beautifully updated home! We went for a girls weekend this fall. I've been to Breck many times, but never imagined I would prefer a season other than ski season. I like this location better than the condo where we usually stay, because you can walk almost everywhere ... to Sbux, dinner, lunch, shopping, and hiking trails. And the views of the mountains are spectacular. The house is very comfortable - updated kitchen and baths are great, beds are comfy, and multiple outdoor decks (with hottub) are awesome! We will definitely be back. I thoroughly enjoyed my stay here! I felt right at home but also enjoyed the sophisticated yet subtle design touches. The front deck faces the mountain scape, while just behind the house (literally!) we could access amazing tails that led to amazing views overlooking the entire town. Three bedrooms and two baths are downstairs along with built-in benches and cabinets for shedding jackets and wet boots. Upstairs opens to a well-equipped kitchen with a dining area, and a living room with huge windows facing the best view of the town and the mountains. The space was perfect for bringing everyone together. And I loved the Jacuzzi off the side deck! This home gave us a perfect blend of relaxing comfort and high-end design details (I later discovered that the owner is a professional interior decorator). I can't wait to go back! I recently stayed in this gorgeous town home/duplex with 4 other ladies for a "girls get away". The duplex was so comfortable and homey. We all had plenty of space with the 4 bedrooms and 3 full baths. We went in early fall (mid-September) to watch the leaves change colors and we were not disappointed. We hiked several local trails which were awesome,but one great surprise was that there was a beautiful hiking trail directly behind the town house. We hiked up this trail and were able to have a beautiful view of the entire city below and the the ski slopes straight ahead. I personally tend to get a little altitude sickness when I go to Colorado and do not like to drive (bad nausea :(). So with the location of this house, we rarely had to drive (big plus for me). The home is nestled in the historic district with lots of cute restaurants, coffee shops, yoga studios, massage salons, churches etc. We got lucky that week and a film festival was going on all over town in different locations. We saw some films and were able to walk to them all. I could also see where the gondola loaded and that was in easy walking distance. Maybe more cumbersome with your skis but there is a free shuttle bus that I did see driving around regularly. From the living area you have a clear view of the ski slopes. They were green and beautiful, but I imagined my self sitting there soon in the winter watching those same slopes covered in snow and skiers and me sipping a hot cup of cocoa. Will definitely go back during skiing season and bring my family. Highly recommend! MINIMUM NIGHT STAY: There is a Minimum Night Stay Requirement on all of our Properties. Sometimes, however, if a GAP is available; We will honor less than the Minimum Night Requirement. The Minimum Age requirement to rent this property is 30. Guest renting, must also be staying at the property. This Property is not Available to College Groups; Nor college age groups. Maximum Occupancy: 10 (including children) A Refundable Security Deposit of $1200 is due 30 days prior to your vacation start date. Damage/Security Deposit is fully Refundable. A Security Sheet will be included in your Confirmation Package from JanesLodges. Sorry, No Pets here. If traveling with your pet; Please check listing 78697 No Smoking. Strictly Enforced. All Guests are Required to Review, Sign and Send back to JanesLodges AFTER RESERVING AND PRIOR TO CHECK-IN: Liability Waiver, Security Sheet, And when applicable a Credit Card Form. These items will be emailed to you from JanesLodges.